Most people are unaware of the impact learning management systems (LMS) have on healthcare organizations. In his article E-learning in the Healthcare Industry, Nikos Andriotis tells us, “For several years, healthcare has been the most popular industry for corporate eLearning in the US, followed by software and marketing companies.” The fact that the healthcare industry is beating software companies in the use of corporate LMS systems is quite telling – this software is not only greatly beneficial to healthcare organizations; they are vital to their success. The list of reasons why no healthcare organization can afford NOT to implement and utilize an LMS is long. The first reason has to do with the incredibly positive effects eLearning has on healthcare training. As you probably know, healthcare professionals are required by law to regularly take continuing education courses. Those in the healthcare field have their hands full trying to keep up with changing protocol and best practices. Also, healthcare teams have the sobering responsibility of getting (and staying) on the same page about certain issues so that they can serve patients to the best of their abilities. There is a ton of information these professionals have to stay up-to-date on. The solution to all this is, of course, healthcare training. But, healthcare training is not as simple as gathering a bunch of people in a classroom, slapping up a few PowerPoint slides and passing out some tests. No, healthcare training must be comprehensive, tailored to each learner and equipped with state-of-the-art educational tools. Due to the erratic schedules of healthcare personnel, training should also be extremely flexible. eLearning can accommodate these needs. Classroom-style training cannot. A cloud-based eLearning platform is perfect for healthcare professionals because it can be accessed anytime, anywhere, from any device with a web browser and Internet access. Healthcare professionals love LMSs for the flexibility they offer, and healthcare administrators prefer eLearning systems for their ability to keep staff members well educated and at the top of their field. In addition to facilitating healthcare training, an LMS can expertly coordinate geographically separated healthcare teams. How? There are a couple of ways. First, eLearning systems are accessible even from remote locations. Second, an LMS can be deployed in many languages. Imagine that one member of a healthcare team is on the other side of the world and speaks a different language than the other members. 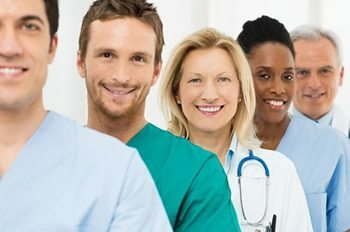 An LMS will allow that healthcare worker to access the exact same information as his or her teammates, in the correct language, from any location. Talk about establishing team unity and effective communication. If every healthcare organization implemented an eLearning system, this world would be a better place. However, not every LMS can properly support a healthcare organization’s needs. Only a social elearning platform like TOPYX has the LMS features needed to facilitate training, coordinate geographically separated healthcare teams and accomplish so much more. An LMS is not a luxury; it is a necessity for healthcare organizations. Healthcare administrators and professionals have enough to think about without having worry over getting to training sessions on time, tracking and reporting learning progress, keeping up with new procedures, etc. An eLearning system makes things easier on every member of a healthcare team. For the sake of ease, efficiency and safety, every healthcare organization should implement an eLearning system.